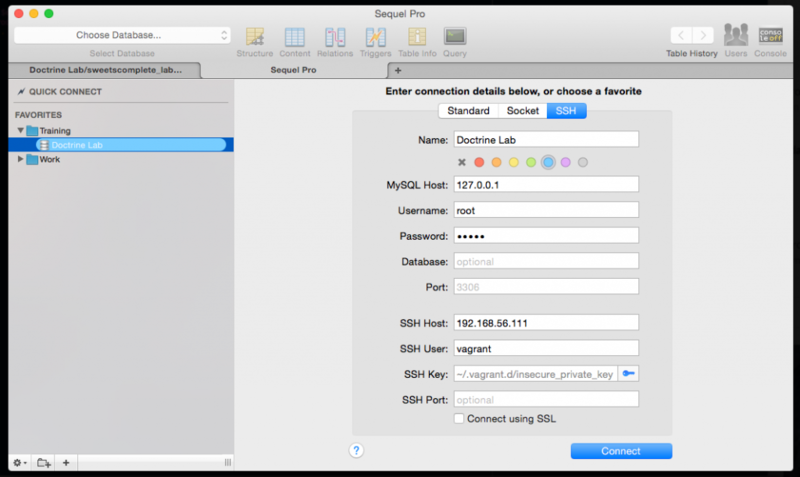 So, we’re running Sequel Pro in the host machine (OSX). The first step is to point the host to your localhost IP: 127.0.0.1. You’ll also need to specify the database’s user and password. Remember, this is the database on the guest machine. You can optionally add the database name and port number. In this case, I left them blank. Next we find the vagrant’s IP address. 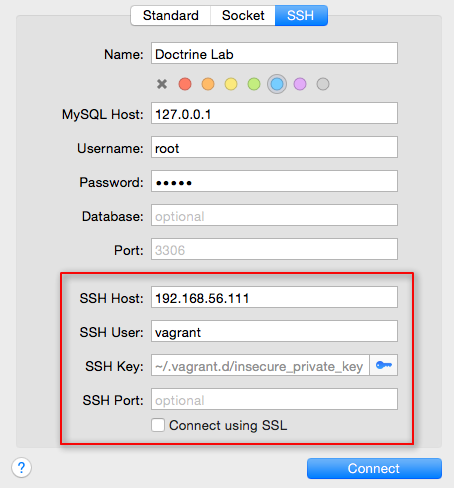 To get the host, you can access your vagrant machine: in the terminal, go to the machine’s directory, and type vagrant ssh. Then in the vagrant command line, type ifconfig. 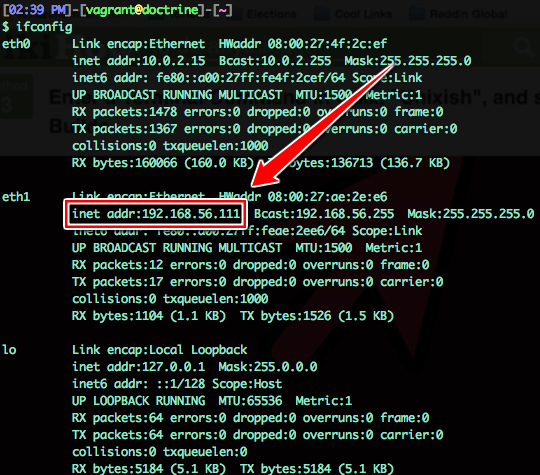 In my case, the eth1, or ethernet 1, adapter is the one with my IP address: 192.168.56.111. This is an internally accessible address. It cannot be accessed from outside my local area network. But this command produces a lengthy listing, with a lot of extra information I don’t need, and don’t necessarily understand. There’s an easier command: hostname -I. Note that this lists all your IP addresses. Once again, we’re looking for the 192.168.x.x. Next we specify our SSH info. 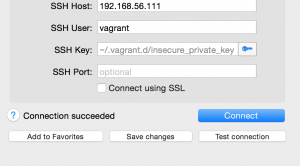 So, we use the IP address from Step 2, user is vagrant, and the SSH key, .vagrant.d/insecure_private_key, has been created by your vagrant up process, and lives in your home directory. Now we test, to make sure we have properly set all our parameters. 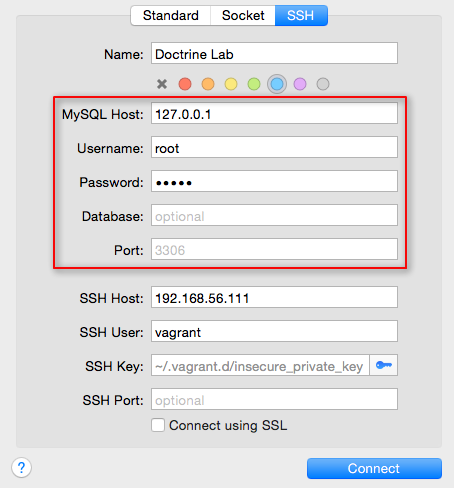 This entry was posted in code, knife the mac, weekend sysadmin, wordpress and tagged MySQL, sequel pro, ssh, vagrant. Bookmark the permalink. Thank you. Saved me a couple of purple links on google. Happy to hear it helped, Frank. Thank you! Your examples and your explanations were both very helpful.